A recent survey of 306 accounting and finance professionals, including more than 200 controllers from the U.S., Canada, Europe, Asia, Africa and Latin America, describes that almost two-thirds have experienced pressure to “cook the books”. Interestingly, the question posed in the survey was specifically focused on pressure to manufacture improved results. Such pressure might occur when the company is looking to acquire financing, meet loan covenants, increase metrics used for bonus calculations, or justify a higher business valuation to a potential buyer. However, there are also instances where finance and accounting professionals might feel pressure to report results that understate performance. This pressure might exist for tax reporting, justifying a loan workout, calculating a buyout provision, or reporting profits to an absentee or minority shareholder. 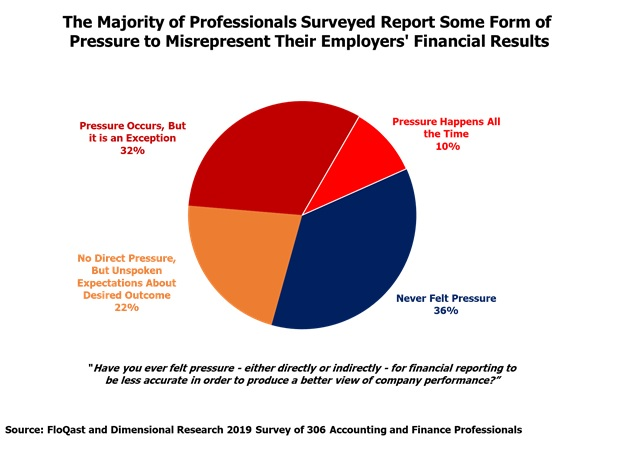 Regardless of whether the pressure is to inflate earnings or decrease earnings, these survey results suggest that those relying on financial reports should be on the lookout for unexpected trends or other red flags or indicia of fraudulent reporting. In many cases a forensic accountant can provide the appropriate due diligence or investigation when misreporting is suspected. Fulcrum Inquiry regularly performs forensic accounting services.